This unique 45 gallon trash receptacle adds a subtle tone of artistry to many areas. The strong concrete base and all steel, powder-coated lid and body exceptionally handles extensive outdoor conditions. A convenient side door helps prevent lifting heavy liners out of the receptacle for easier servicing. The decorative retro design makes this placement of this receptacle suiting for indoor entrances and walkway spaces. 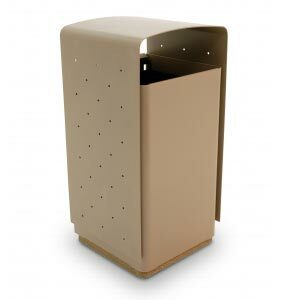 This heavy-duty commercial grade receptacle provides natural style, function and durability.